The 70's were known for classic curly hairstyles. Farrah Fawcett started the trend with the feathered and flicked hairstyle that curled on the end. Barbara Streisand and Bette Midler rocked a fun perm hairstyle that showcased crunchy curls and lots of foxy volume. But no one at the time had ravishing ringlets like Donna Summer. Her iconic curls are legendary and helped to give her the title of Queen of Disco. 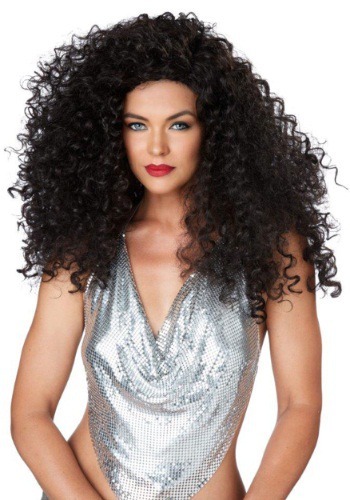 Now you can point your finger in the air with confidence when you wear this killer diva wig. Once your sparkly ensemble is on and your makeup looks perfect, it's time to don this disco diva wig. You'll look just like the 70's songstress! Now is your chance to own the dance floor with your Donna Summer-esque wig. Don't forget to work those curls, lady! Didn’t like, too much hair, dint look real.